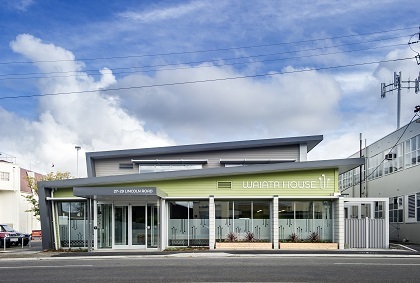 Constructed on the site of Masterton’s old opera house, Waiata House is a community centre of health and wellbeing. A successful collaboration of modern design, multiple facilities and attention to the site’s history. The $3 million, 1,680 square-metre building is built to Green Star environmental standards, incorporating multiple energy efficiency features including double glazing throughout, a central atrium that stores solar heat, and automatic temperature and lighting control. Its structure meets 130 per cent of the building code’s seismic safety standards. The ground floor is a concentrated collection of meeting rooms and facilities, merging with a flexible open-plan office space, while the first floor is a host of large spaces including a training room. All the functions of the building are arranged around the core light-well. This in turn divides the public and private space of the clients from the staff designated areas. The interior showcases arched windows, decorative corbels and the memorial stone which were salvaged from the original opera house and recycled Matai floorboards are also incorporated into the new building. Concrete, steel, aluminium and timber are combined to striking effect, simultaneously establishing a flexible, clean aesthetic, essential to a health facility. An extremely high level of workmanship was maintained throughout the build, with the exacting standards and attention to detail extending to the inside where a quality finish has been achieved using our in house Eco Certified painters recognised for the high quality of their work as well as their sustainability practices. Due to the short project timeframe and the relationship between the key group members for performance and construction skills on previous projects carried out for the client, the project was undertaken as a Negotiated Contract. The budget was established on preliminary brief and concept drawings. The Project Control Group then worked collectively to tailor the building to meet the brief incorporating design elements as well as meeting the tenants and clients requirements within budget.